First of all I want to thank you all for your kind words and encouragement on my Which Way? quilt. It was interesting to read the different opinions both in the comments section and on the email lists. Jodie called my quilting stitches Sashiko for instance. I hadn’t intended them as such and was interested that they should be categorised that way. Is Sashiko the Japanese name for large stitches or is there more to it than this? Anyway I just wanted to say “thank you”. Please continue to comment. I love to read what you have to say and I’m always open to feedback and constructive criticism. I have a PO Box which I hardly ever use. The other day I decided to check it “just in case” only to find I had been RAQed (Random Act of Quiltiness)! I belong to a lovely email list called Quilt ‘n’ Friends and Mary, one of the list members from Canada had sent me this charm pack of Kona warms. It was such a lovely surprise. Thank you Mary! As you know I had been hoping to practice my free motion quilting yesterday but I just got so engrossed in the Which Way? quilt that I didn’t want to stop till I had it finished. (Just a little still left to do). In preparation for the practice I bought a Supreme Slider and some Teflon bobbin washers. Have any of you used these and if so, did you find them helpful? Mark your calendar for Monday, December 13th! It’s give-away day. I’m again taking part in the Sew Mama Sew give-away day. If you visit this blog tomorrow there will be a give away and if you visit the Sew Mama Sew blog tomorrow (Monday US time) you’ll find lists of every blog taking part. Have fun! I have just started doing a little free motion quilting and will be interested in how you like the Supreme Slider – I don’t have anything like it but I think it might help my jerkiness – but I am also concerned that it will slide too much and send my BSR bonkers. So I’ll be really interested in hearing. Thanks!! Hi Munaiba, I have used the Supreme Slider for years. I like it a lot. I have a Janome 7700 and for some reason the bed of this machine is “stickier” than the one I used to have. Not sure why they’d put this type of material on a machine designed for quilting. But the SS helps with that problem. Wearing Machingers gloves and using this slider keeps my FMQing in top notch shape. 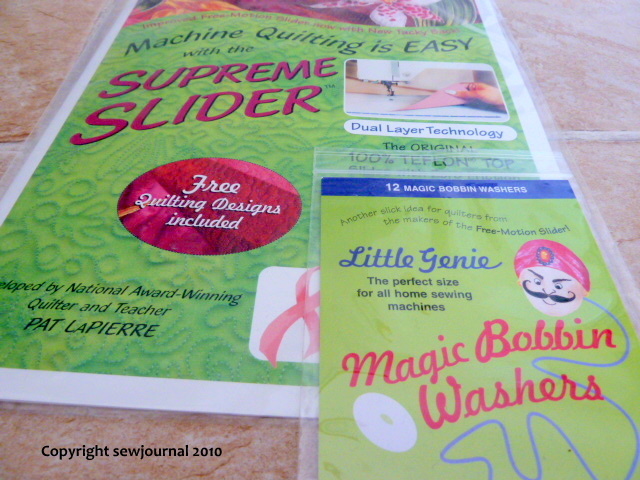 As to the Bobbin Genies, I’ve not used them but intend to get some to try. I’ve only now, again with this new machine, experienced bobbin backlash. odd! I know a little bit about Sashiko. It started out as a way to reinforce aging fabric. Now it’s a decorative form of needlework worked in a coarse (sashiko) thread in geometric patterns formed by an uneven running stitch. The stitch is longer on the front than the back. 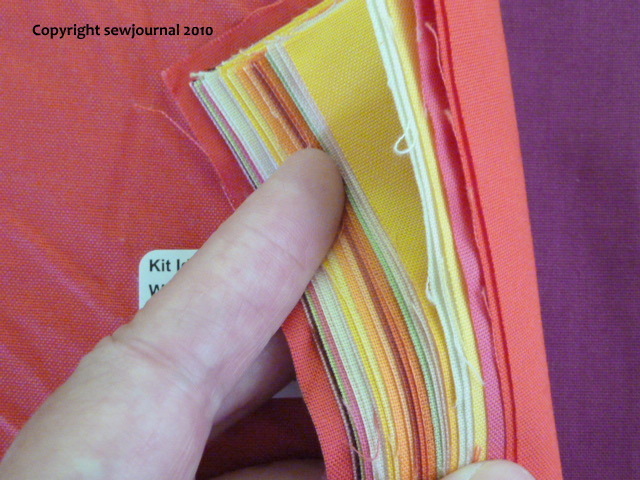 So it’s different than big stitch quilting where the stitches are the same size front & back. I think many tradtitional sashiko patterns translate wonderfully to quilting.